(Please disregard the nicks and gouges in the samples. We’ve been abusing them to see what they can stand up to and what they might look like after a few years of abuse. *wink* ) So…what do you think? lighter? darker? green? blue? ugh! This is so hard! LOL! 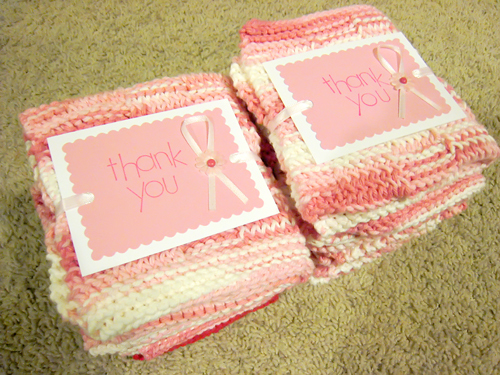 In other news…if you have been waiting for your washcloth from donating to my Race for the Cure run…they are finally done! I should be getting those out to everyone soon. Check ’em out! Ok. I’m off to watch some totally mindless TV. Top Chef reunion show and the season premiers of America’s Next Top Model and Make Me a Supermodel. Yes. I have a college degree. Gotta go! I like both samples but I am concerned about the darker one also, regarding dirt and showing wear. 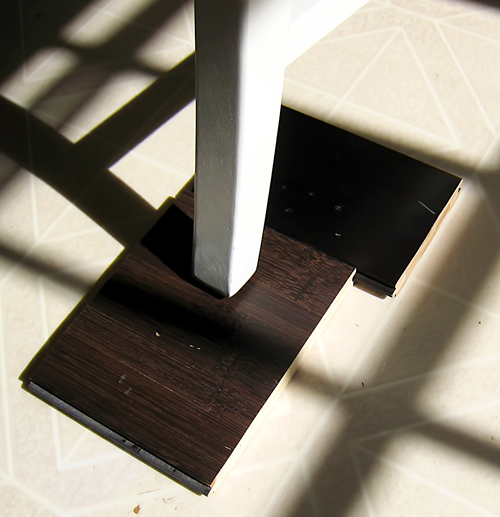 Burnt Mocha appears more natural and may reflect less light from surrounding fixtures which may be a plus if you are concerned about glare off the darker flooring. Burnt Mocha gets my vote and makes me want Starbuck’s. I vote Burnt Mocha for all the reasons listed above. Even in the bright sunlight kitchen photo, one still can not see any grain in the darker sample. Think the Mocha would go well with oak cabinets and black appliances. 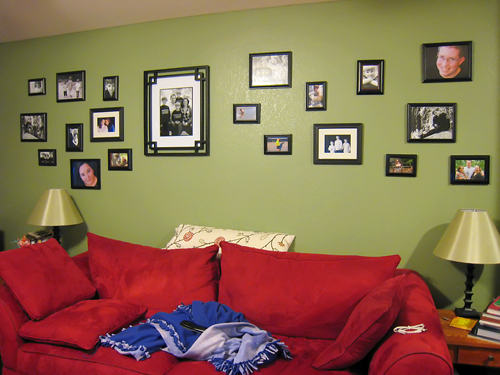 As for the wall color — probably would be easier to get the flooring installed and play around with color chips. Good Luck! A friend of mine had black stained hardwoods in her previous home and it does look really good, especially with a blue/slate grey wall color. However, about a year and a half after the floors were finished she would go over high traffic areas with a black sharpie marker. I’m not sure if bamboo will have the same type of wear as oak, but check into it. I can’t remember if you are keeping the carpet in the living room area or not. 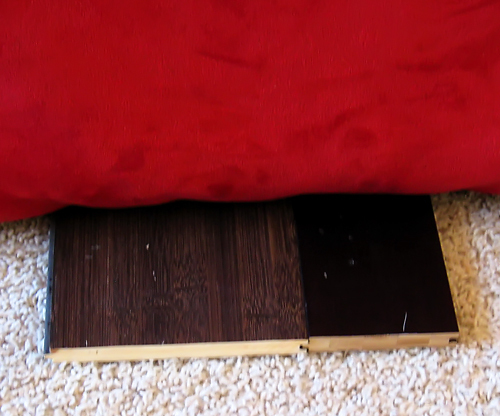 If you are keeping the carpet, the blue/slate grey color may look darker in that room. I say this because we actually painted our bedroom the color blue that was in my friends house with the black floors. Our blue is much darker than hers was, since our floors are lighter. But, you probably know better than me how color hues are pulled from different surroundings. 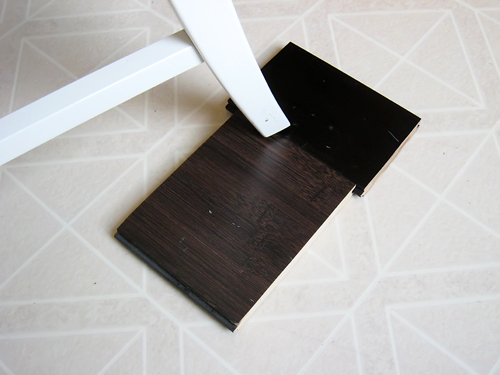 I would pick up some paint cards to see how dark or light they look against your flooring samples. I gotta say that I like the Mocha too. Ohhh with slate grey… beautiful! Wish we could totally redo! I am going Mocha! I would like to be the rebel and pick the other one, but it is just not the better choice!